Rate This Thread - TaxSlayer Bowl Rings. I don't know if any of you all saw or not, but our football team received bowl rings for the Taxslayer Bowl. What is your alls opinion on this? I personally am not a fan because to me it gives us a bad look at a program that's looking to gain some respect. It is kind of like a participation trophy. But I don't know though, they may always give out rings for just making the bowl game. From where our program was only a few short years ago.... to where it's at now, it feels like we've started over. This game vs. Vanderbilt was TERRIBLE!!!!! Our program was dead in the water. Fast forward a few years, we are 7-5 and going to a New Years Eve bowl game. We beat the Heisman Trophy winner on his home field and had more fans at stadium than when the team arrived what was at the Vandy game shown above. These rings celebrate winning the Governor's Cup (an actual trophy) over U of L as well as making it to a Bowl game. 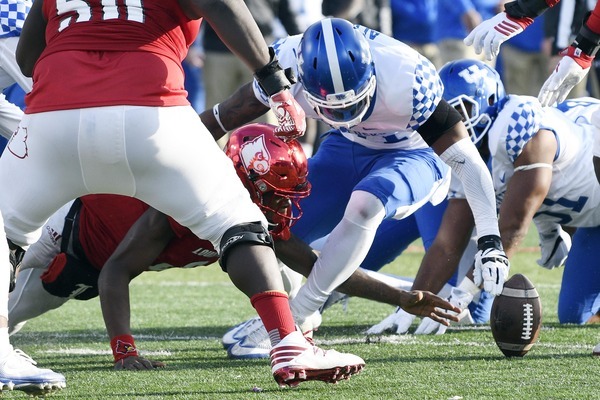 Did anybody see Lamar Jackson do the Heisman pose in the UK vs. U of L game??? Did anybody see Lamar Jackson fumble??? ^I guess I see what you are saying with getting them trophies for making the bowl game. But do others programs do that? Yes.... I'll attach some pics later of other programs that have done the same thing. From Kentucky Sports Radio's website. This Loserville's 2015 Music City Bowl ring. This is Florida State's 2015 Bowl ring. Beating Loserville was our Bowl Game win. Loosing 5 straight games and seeing our program in the dumps.... then seeing our program back to beat what was at point in the season the #2 team in the Nation on their field and with a Heisman trophy winning QB. The TaxSlayer bowl was an exhibition and gave our fans a chance to party in Florida on New Years Eve. Are things so bad, we are now celebrating mediocracy. For beating Louisville and losing a bowl game. Start with we should expect to beat Louisville every time we take the field, and in all honestly we should beat them at least 80% of the time. I'm all for giving rings after a bowl win, but after getting hammered the only thing you should be worried about is a long bus ride home. Does our basketball program players receive rings for final fours? I think making it to the Final Four is a lot more deserving of a ring than losing the Tax Slayer Bowl. I agree but I was asking that just to get a sense of what the basketball team deems as deserving of a ring with its rich history. IMHO rings should only be given to national champions. Not conference champs, not toilet bowl Champs (especially when you lose), and def. Not for one regular season game. It doesn't matter how many schools also do it. Who really wants a ring from a mid tier at best bowl that you lost?